Organize and Outline all kinds of notes, ideas, links and lists in WhizFolder notebook files. Save and recall a variety of information in Rich Text with links, pictures and OLE objects. WhizFolders is more than a Notes Organizer and Outliner. Discover how it can be used in a variety of ways. 4 Are you a writer? Click to read an interesting essay "Better not start writing your book with a Word Processor." You need a powerful List type tool that not only lets you record your ideas and notes but rearrange, link or join them as necessary. The key to managing your notes and ideas well is to be able to briefly list them by a title, in a hierarchy. You look at the content of a note only when you really need it. You won't find this powerful list metaphor in a word processor or text editor. Instead, you need a List-based tool like WhizFolders where you write notes in pieces, classifying and keeping each piece of note separately as you go. How does it help when you are able to write your notes as pieces in a list? This helps in many ways. You keep the related notes and ideas together, and that helps you get a better hold on your subject matter whether you are planning or learning. You can move around the pieces later to change their order as your ideas change (as they often do). WhizFolders has all these features and is a perfect tool for any kind of note taking and research. What is more, you can bunch up any number of notes to export a full document any time. Save your effort in brainstorming new ideas and plans. Use WhizFolders for all your note taking. See how a WhizFolder notebook file looks like with its powerful Outlining list. Go to the Quick Demo to take a look. The Outlining List in WhizFolders is like a table of contents of notes that you directly control for maximum creativity. The list shows the titles of notes, quite similar to file names. You can arrange these titles in a hierarchy by a quick drag and drop or by "Move" buttons. The best thing is that you can merge many of these notes together to make a single document while doing copy/paste, export or printing. Working in such an outlining list helps you think, write and learn better. Click here to know how. How does this Outlining List help you think, write and learn better? If you are working on a difficult or new concept, you quickly break it down into multiple notes in a hierarchy. Move the notes around or insert more notes to aid in your thinking. If you are a writer, you will understand this process as "outlining." This helps you plan your book in pieces. When you are done, you can print or export everything together to make that first draft, ready for your word processor for advanced formatting. This makes WhizFolders a first-class Research Tool with free format notes. A similar principle helps you learn any difficult subject faster. Click here to know how. When you are learning a new subject, the list really helps a lot. For example, see the screenshot on the left where I was studying ASP.NET, a development framework, from a book. I made notes only for the things I didn't know and in the order that I understood them better. I broke the difficult concepts into many notes and child notes as necessary. This helped me classify them better. I made my own Tips and Tricks branch as I read along. This study session was even faster because the book I was studying was an eBook, and I saved time by copying and pasting pictures of the sample source code instead of typing it. Click here to read the remaining part on learning. In study and learning, the "reviewing" phase is equally important. The picture shows another set of notes I made when reading a copy writing book. I often review these notes and mark important notes by colors and icons. I insert hyperlinks that allowed me to go from one related note to another when reviewing. I assign my own keyword tags to notes in order to find them by keywords later. Finally, I often print all the notes together with an automatic Table of Contents, made up from the list. There are many more useful features in this list. Click here to know more. The note titles can be wrapped on multiple lines. If you are a writer, this gives you an instant outlining tool where you build up the table of contents of what you are going to write. Then fill up the text later. You can highlight a note to make it stand out by changing its color or by assigning an icon. You can switch on the Check-marks feature to turn this into a Todo list contaning free-format, detailed notes. 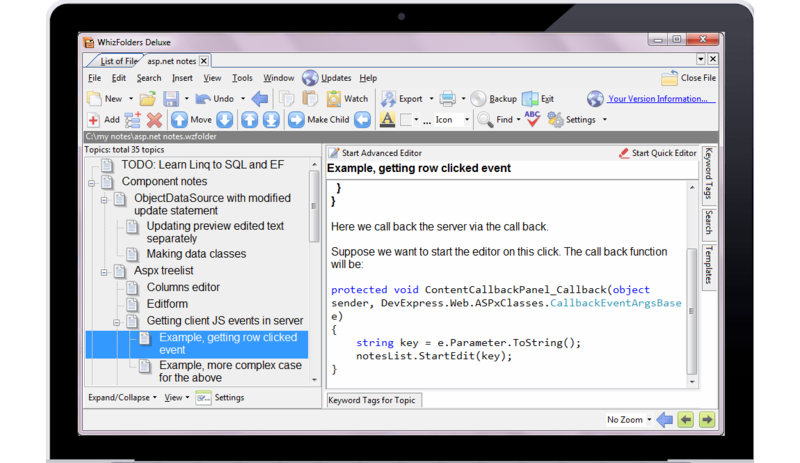 You can copy, paste, duplicate, print and export a complete branch of notes with proper indentation. 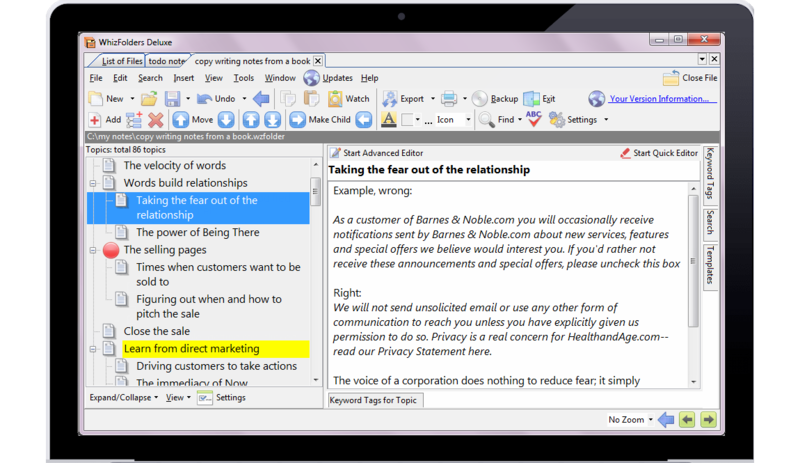 The combined power of the list and the rich text note editor make it possible to have many more powerful features in WhizFolders. Click here to continue reading. 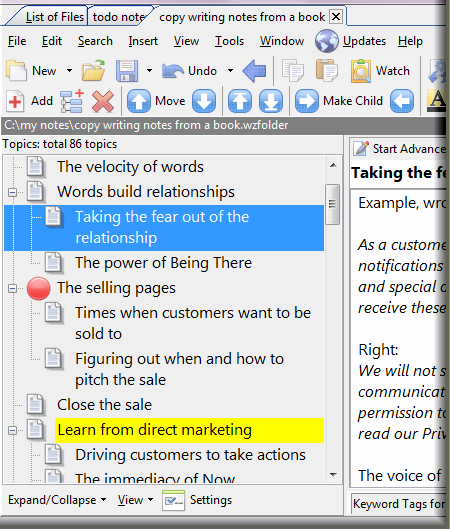 Insert Hyperlinks to connect your notes and manage those cross-thoughts. You can use drag and drop to move whole branches of notes in the list that include the children. Assign keyword tags to find notes easily. Search for words with AND, OR, NEAR operators. Recover deleted or changed notes from a special archive. Advanced clipboard features to collect research material. Click on the Features page above to see more details on features. Click here to continue reading. You can make a Todo List of Notes by using the features of drag and drop and check marks. You can put such to-do tasks within your own named branches. 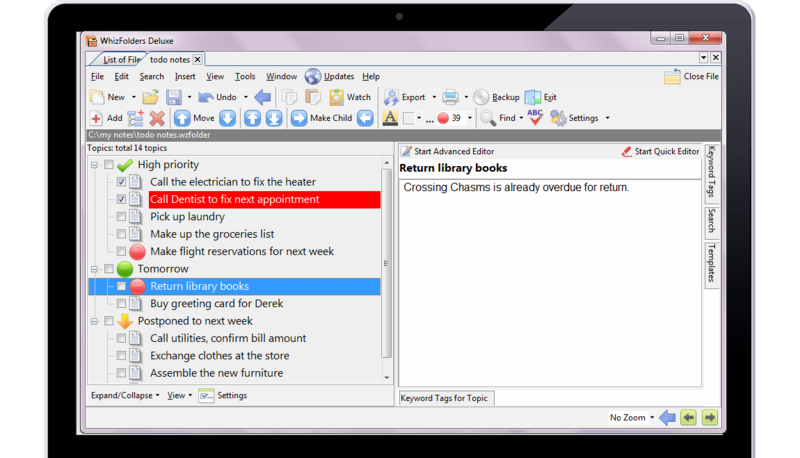 For example, see tasks under "High-priority" in the picture. Another advantage here is that the actual text of an task can be as large as you want with rich text and pictures. Drag and drop lets you move the tasks easily, for example, to the "High priority" branch. Click here to continue with the Todo list example. You can be very creative with these free-format Todo lists. You can design your own branches and move the tasks around. For example, see "Tomorrow" and the "Postponed" branches. Normally, you would use Check-marks to mark the tasks as done. But you can even make a "Finished" branch and drag to it. This was just an example of creative use of WhizFolders. There are many more. Click here to continue reading. Realize the power you get when you combine an easy to use outlining list with a capable rich text editor. Get an idea of the kind of applications possible with a note outliner like WhizFolders. YOU HAVE REACHED THE END OF THIS INTRODUCTION! Want to see how a WhizFolder file looks like? Click here to go to the "Demos" page. Don't just collect your notes, put them in an outline to recall and review them faster. You can use diferent outlines in different WhizFolder files. Note that WhizFolders is not a Mac outliner program. But some of our users are using it on Mac with the help of virtual machine software like Parallels, VMWare or similar programs. Granted, you may be collecting notes even when on the move, with a mobile notes organizer app like evernote or onenote. But can you make sense of all these collected notes as a cohesive entity? For many activities like writing, learning or planning, just collecting and placing related free format notes in notebook files or being able to search by tags is not enough. That's about all that a Notes Organizer program can do. To go further than that, you need an outliner software to arrange these notes in a hierarchy to make them really useful. Imagine having a text book without a hierarchical table of contents. That's what a Notes Organizer program is without the features of an Outliner. Whether you are making notes for writing, research or study, there is always a need to constantly rearrange your notes to make better sense of them. See many examples, later on this page. Get WhizFolders, a Two-pane Outliner and Organizer for all your notes, ideas and writing projects. Think, write and learn better with this amazing tool! The idea in WhizFolders is to manage and move the notes just by their "titles." **Some users are using WhizFolders on Mac through VM utilities. See Features page for details. 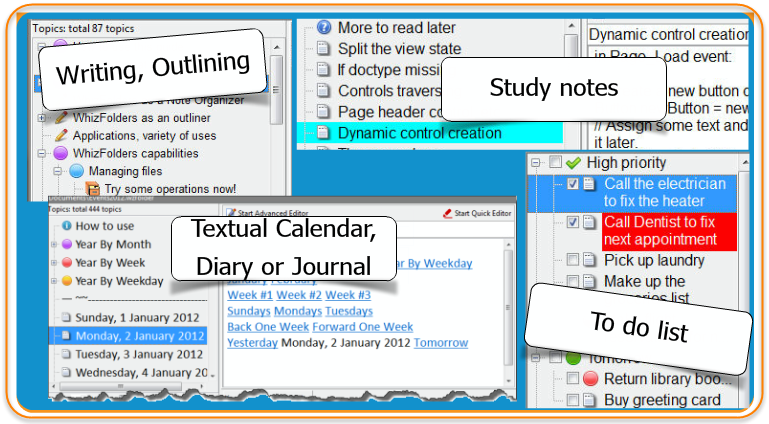 On the Demos page, there is an interesting Presentation on how you can use WhizFolders in many different ways--for writing, for learning, as a textual calendar, and a to do list. These are just the starting ideas. Once you get the hang of it, what you can do is only limited by your imagination.